As promised a little over a week ago, we are ready with our first batch of devices. These are unique and special–only a few of this model will be made before we move to a newer form factor. Read on to find out how you can get your hands on one! This first batch will look like our test devices – see the picture on the right. They come with a special 2TB hard drive (just for this one batch, our future devices come with 1TB drives) and you’ll get our newly designed ownCloud case send to you for free once it is available next month! 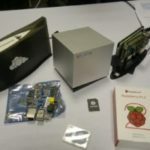 The devices come pre-installed with ownCloud with a bootable image on the SD card and another image on the hard drive. Once you’ve put the box together with a Raspberry Pi 2 (NOT included!) you connect it with a cable to the network and connect the power. 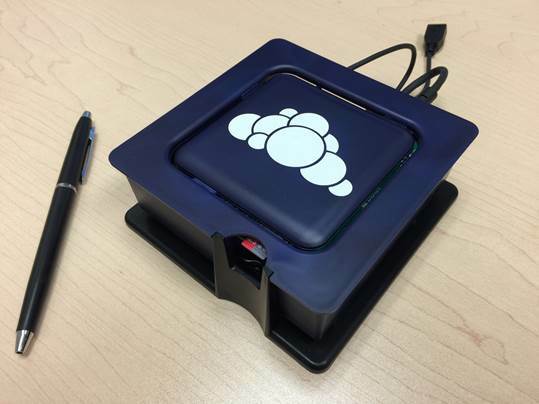 The device will boot and present itself under the url owncloud.local on the network. When you visit that URL in the browser of a laptop on the same network, you’ll be presented with the “create an account” screen of ownCloud! 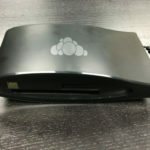 Meanwhile, your Raspberry Pi, provided it has a internet connection, will have updated to the latest version of our ownCloud Snap. Yes, this is how Snappy Ubuntu Core rolls: it upgrades automatically and unattended to the latest version, providing an atomic rollback option in case things break! While Ubuntu Core 16.04 is still in beta we can’t completely promise that there won’t be any breakage that requires a re-flash of the devices so we recommend against putting production data on this device, things won’t break beyond the point of recovery. This new image should have the basic apps and some performance tweaks in place to provide a workable experience, but it is far from done. That’s how this is, of course, a first batch–you’re on the front seat here and you’re bound to get a bit wet. WDLabs is making available a limited number of these enhanced pioneer development kits. To get one, we’re asking for a $50 payment to our Bountysource account where you’ll be free to assign the funding to one or more features you care about. Participation is limited to Europe and North America at this time. You email our community manager on jos@owncloud.com that you’d like to purchase one of the devices. Be sure to include your address details – a real shipping address (not a PO box) and phone number. He confirms there’s a device with your name on it (or not, in case we’re already out). You pay USD 50 to our Bountysource account! You’re free to assign this to one or more features you care about but be sure your name is visible so we can check it’s you! We will then send you your device, which should arrive by the end of this week or beginning of next week, depending on where you live. Note that the USD 50 isn’t the final price of the devices and neither is this the final design! We’ll update this blog as soon as we’re out of devices. 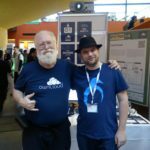 If you’re too late, no worries, the next batch of ownCloud devices will consist of more devices and should be available in another 4-6 weeks! Thanks for your interest and – we’ll have a bigger batch soon, promise! 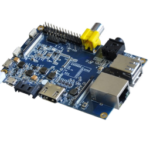 I’ve got a pi, would like a owncloud pi! Please keep doing what you are doing! !